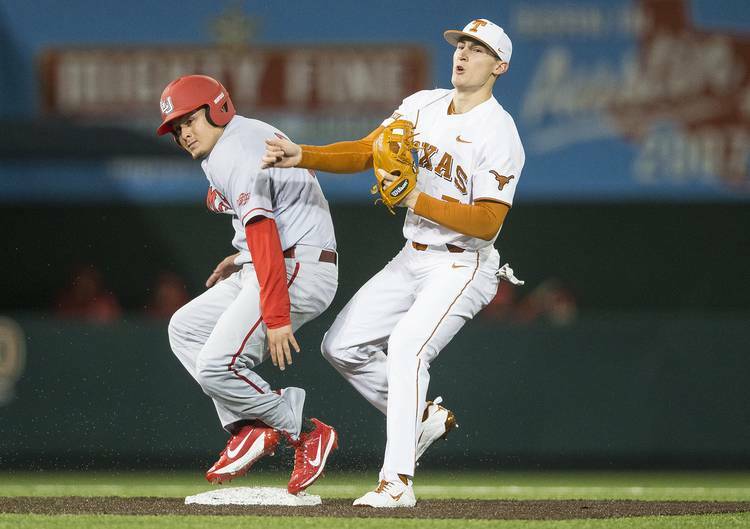 Depending on which game of the Orange and White Fall World Series they attended, Texas baseball fans may have been tipped off to where senior Masen Hibbeler will play this spring. In two of the three games, Hibbeler started at shortstop for the White team. David Hamilton and his gifted glove aren’t going anywhere, however, so a better hint was likely given in the third game. In the finale, Hibbeler recorded four defensive assists and three putouts at second base. After transferring from Odessa College, Hibbeler opened last season as UT’s second baseman. He earned some reps at shortstop and even started eight times at first base. His primary home, though, was in left field. For the season, Hibbeler committed six errors and boasted a .968 fielding percentage. Texas will need a new second baseman this spring since Kody Clemens is playing in the Detroit Tigers’ farm system. Last year, Clemens earned All-American accolades while leading Texas in batting average (.351), home runs (24) and RBIs (72). Freshmen Bryce Reagan and Lance Ford are additional options at second base if Texas coach David Pierce wants to play Hibbeler at first base or the outfield. Pierce assessed that Hibbeler is not the only versatile player on his roster. That could give UT’s third-year coach a few options for late-inning switches. When asked if he was campaigning for playing time at different positions, Hibbeler joked that he needs to work on his pitching. If Hibbeler can perfect his fastball, maybe he’ll have a Jake McKenzie-like game in him. Last year, McKenzie became the first Longhorn to play all nine innings in a single game.